Making small areas seem bigger is not just the pre-occupation of claustrophobics and makeover fanatics. The fact is most modern homeowners (and those who rent as well) have to deal with smaller and smaller residential spaces, especially if they live in high rise apartment complexes in the cities. Since remodeling is usually beyond the budget of the middle-income city resident, most defer to the wisdom of interior design specialists who have a lot to say in the matter of making small bathrooms seem bigger. 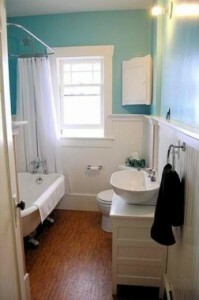 Here are a few guaranteed and affordable ideas for small bathrooms to make them seem bigger. Tiles on the bathroom floors and walls serve to protect the structure from moisture. 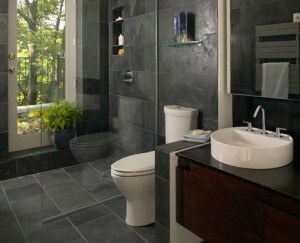 Tiles are also known to provide a certain level of warmth to the bathroom. 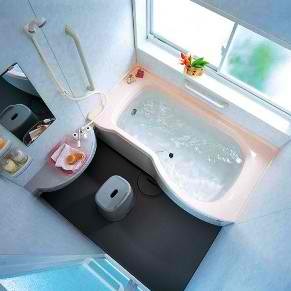 The less known benefit of bathroom tiles is that they also function to give the room a sense of expansion. This happens because the glossy tile surface adds brightness to an otherwise limited space. Since glass lets in more light, choosing a transparent or translucent glass panel over an opaque shower curtain adds to the sense of space in a rather small bathroom. Glass also has an unparalleled ability to visually extend the available space. For a more private shower stall, you may use tinted glass, of course. When the elements that make up your bathroom are individually not bulky in construction, there is more space in between them. And even when the space is very limited, the slender lines of a slim pedestal sink contributes to the illusion of a much bigger bathroom. 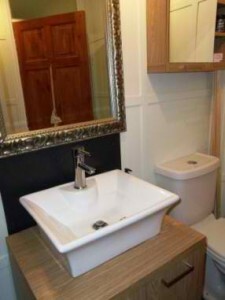 There are a number of pedestal sink models to choose from. 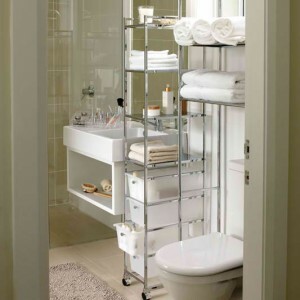 Mirrors are perhaps the quickest fix when it comes to expanding the space within your bathroom. 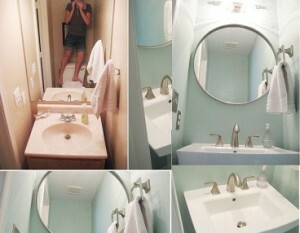 If you can afford a full-length mirror, you’re in for a doubling of your bathroom size. And there are so many strategic places to mount a regular mirror such that the bathroom looks so much larger than its actual size. Contemporary design ideas are already redefining the concept of storage. 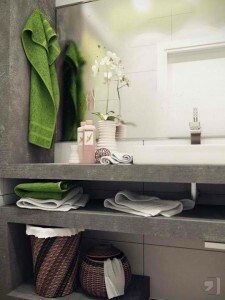 If you think out of the box and leave the traditional idea of cabinets and storage bins outside of your bathroom door, you’ll find that you can use existing structures, or make a few modifications on what is already there, to hold your bathroom supplies. Countertops can be maximized some more, as well as the blank spaces under them. If you have the option to choose a type of sink, make sure that is does not take up so much space and that the area where it stands is functional as well and can be used for storage. If you can choose where to place the sink, a space saving option is to fit it on the corner where two walls meet. If you have the resources, a wall-mounted sink will give you lots of space for other things. 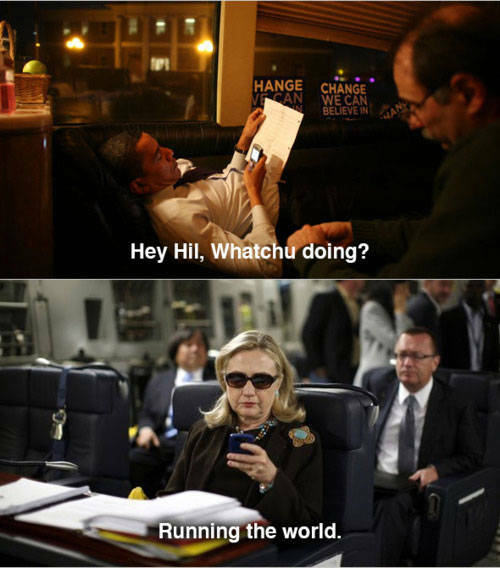 We’re not talking about the plumbing. 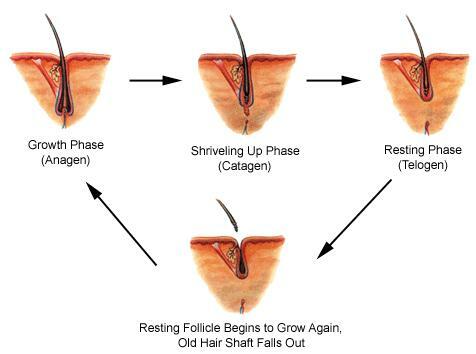 This particular “flow” pertains to the harmonious arrangement of your bathroom. This includes the flow of people in and out of the room such that nothing gets in the way. Part of this is also keeping the bathroom elements organized in terms of function, and making sure that it is clutter free at all times. Who says you need cabinets in your bathroom? If space is already limited, it pays to explore other possibilities. Abandon the idea of a cabinet for storage of towels and bathroom supplies. You can opt for a free standing slim stand that can accommodate numerous storage trays and baskets. A moveable stand is even more ideal since this allows you to move things around if you get bored. Lighting contributes a lot to opening up the space in a very limited area. It would be nice if you can arrange the area such that natural light gets in unimpeded. (A skylight would be nice.) Proper lighting gives the beholder the sense that the walls are further apart than they really are. And when you choose lighting fixtures and bulbs you’re looking for mounts that produce little or no shadow. Remember this simple yet important principle: dark colors tighten an already compact space while lighter shades expand the walls, making them seem bigger. 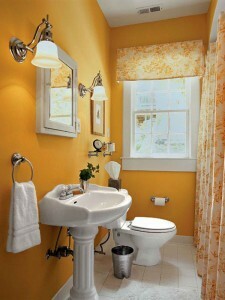 And remember that both the walls and fixtures need to be light in color. Your choices include neutral colors and pastel shades. You don’t need to feel cornered in the limited spaces available in urban apartments because space issues have simple solutions. 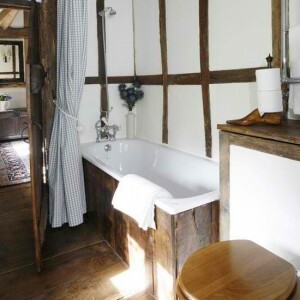 And you don’t need to spend too much so that you don’t feel uncomfortable within your bathroom walls.